New year, new tricks to learn! This camp is crafted to give a comprehensive introduction to all things AcroYoga. There will be a strong emphasis on basing techniques which we will apply into our Therapeutic Flying work. Therapeutic Flying takes the principals of Thai Massage into the air in order to access the additional sensation and support of gravity. This helps traction the spine and allows for an amazing "zero gravity" sensation. This is as beneficial for the mind as it is for the body. Speaking from personal experience, therapeutic flying has corrected multiple back problems for me and is beneficial and modifiable for many bodies and ailments. We're always building our base of washing machine know how. This weekend's skills include: London Spin, Pick Pocket, Nunchucks. This camp we take it a step further constructing a flow of our own. The highest level of learning is synthesis. 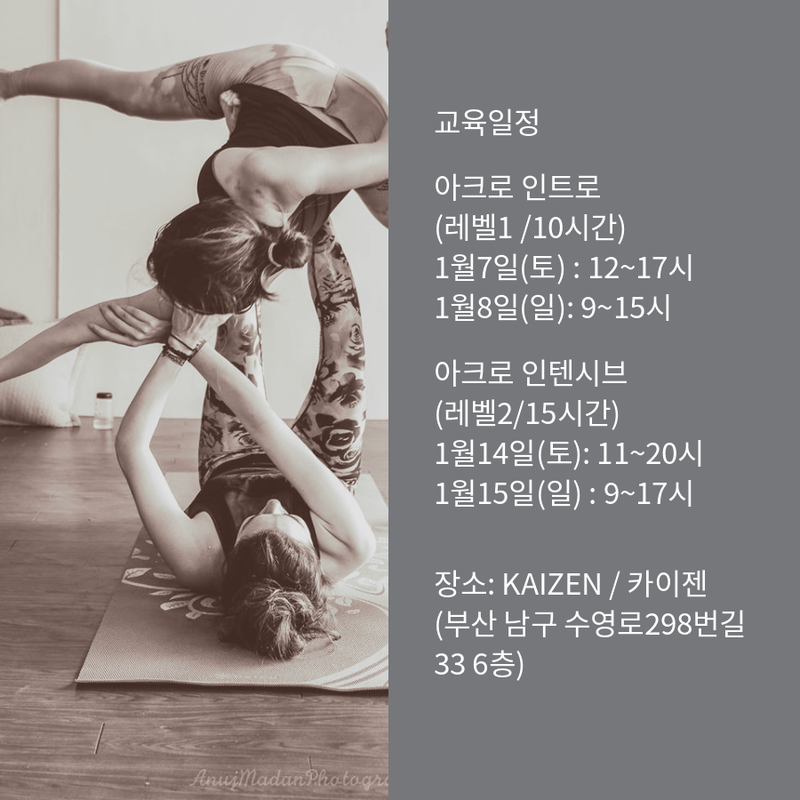 Rather than dump you in the deep end starting a routine from scratch, you will be given the framework of an original flow from Mindy and Inkyu from which to begin constructing something new! Please specific whether injury is past or current. If none, write "none." Thank you! Please remember that to be eligible for applicable discounts and to secure your space, payment must be received to confirm your participant.